Look younger with better posture | Is This Mutton? If we aren't careful, as we get older poor posture means our heads start projecting forwards. This becomes more advanced until we look like tortoises. Now it's happening at a younger age, thanks to "text neck" and computers. You often see a lump of flesh on the back of the necks of young people whose posture is bad. This is the start of the cycle of problems. Older people with osteoporosis may have a "dowager's hump" but this is a different issue and won't be corrected with the exercises below. Being overweight, foot problems, genetics and low self esteem are other causes of poor posture. But fortunately we can nip problems in the bud if we take preventative steps. How do I know if my posture is bad? According to the Ultimate Guide to Good Posture, the way to find out is to stand with the back of your head against a wall and place heels 5 centimetres (two inches) from the wall. Your buttocks and shoulder blades should touch the wall. There should be less than 5 cms (two inches)between your neck or small of the back and the wall. A larger gap indicates bad posture and a curving spine. 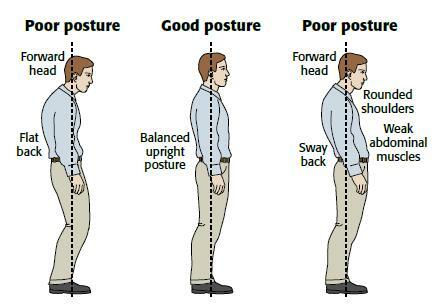 This graphic shows the difference between good and bad posture. What are the effects of bad posture? Posture is an important part of preventing problems ranging from back pain to fatigue. When the back is straight, the spine is supported and stabilized, but as you slouch or practice other methods of poor posture, your spine no longer has the support it needs to stay balanced, leading to many health problems. These include sore muscles, curvature of the spine and nerve constriction. For every inch the head moves forward in posture, its weight on your neck and upper back muscles increases by 10 pounds! I scoured the internet and You Tube to find a good commonsense approach that would be easy to adapt into everyday life. The three exercises in the video below don't take very long to do, twice a day. Something else I've started to do is "up back and down." Whenever you remember, lift up your shoulders, towards your ears. Pull them back, then lower. This helps stop rounding the shoulders. At least, it makes me more aware of the difference. Chiropractors also tell you to visualize a string from the top of your head, pulling it upwards and lifting your hips. Try this if you like to visualize. Exercises to strengthen your core and buttock muscles, and back extensions, will help correct a slouching posture. In the gym, bridges, back extensions and planks will help. How to address other postural problems the "Donald Duck" (bottom is stuck out) are addressed very well on this NHS site. I hope the tips will help: I am definitely putting them into practice. 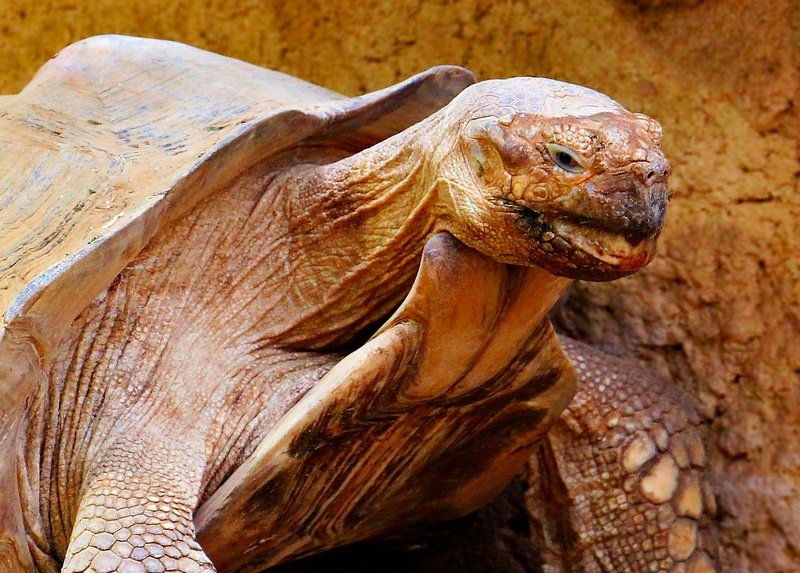 After all, who wants to look like a tortoise? Sharing this post with Saturday Share at Not Dressed As Lamb, Weekend Blog Hop at Claire Justine and Rena at Fine Whatever. We're never too young to start! Have a great weekend. Thanks Gail, I am going to work on this after seeing my posture in today's post. Thanks for sharing at the weekend blog hop. I try to think about my posture. But sometimes when I am out of breath, I tend to walk with hanging shoulders. I hate that. Gail, this is a brilliant post and I hope you get lots of reads because there is so much important information within it. I must have looked like that turtle when my osteopath first caught me in his waiting room peering at Hello!, because that was the first thing he addressed when I got in his room. And my mum used to flag my dowagers hump when I was in my 40s, so I must be a lost cause, all told! Glad it was useful Mary - the problem is we only become aware of our poor posture when we start to have health problems. Terrific post Gail and thanks for the reminder. Now I need to go and do those exercises .